This question was recently posed to me by a friend. He had a friend whose pet was diagnosed with cancer and wanted to know if we could help him. The answer is an emphatic YES. Homeopathy can be used to treat animals. We have been treating some of our patients’ pets with homeopathy for the past 25 years and the most common comment is that the pet somehow knows it is being given homeopathic medicine and not only readily takes the dose but eagerly waits for it. It is slightly difficult to treat pets because they cannot speak and so the greatest input that we get from humans- sensations and feelings is missing. However a homeopath can use his power of observation and can also interpret the behavior of the animals to decide the correct remedy. Abscess in the paws-oozing bright red blood but no pus. Can walk, but it is slightly painful when walking on any rough surface. Ear discharge-oozes only when his ear flaps are everted. Discharge-cream colored, and extremely offensive. Severe itching of the skin, worse on scratching with falling off of the hair in the affected parts. The skin over the affected region has become pigmented and the scratched part becomes sticky. 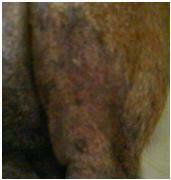 He has had bacterial and fungal infections of the skin in the past. He has also had stones in the urinary bladder for which he was treated with a proprietary Ayurvedic medicine. He has cataract in both the eyes and is on treatment for hypothyroidism. Just like in the human patients, the totality of his symptoms was considered to begin the homeopathic treatment. This included not just the physical complaints but also the emotional state (as observed by his family and us) and other peculiarities in the reaction to the environment. The homeopathic drug that we prescribed was Graphites. The skin rapidly improved; with the result the hair started growing and the fungal infection came under control. The ear discharge persisted, however, for which Medorrhinum was prescribed. The patient recovered but was brought back a year later for a fungal infection on the skin. At this point Bacillinum was prescribed with rapid improvement of the fungal infection and re-growth of hair. A year later, he had a severe attack of breathlessness and fever. He was not eating well and had become dull. The X-ray of the chest, showed a pleural effusion (collection of fluid in the membranes surrounding the lungs) and enlargement of the heart. He was now given Apis for these complaints. The fever came down the next night. During this episode of pleural effusion and Hypertrophic Obstructive Cardio Myopathy (HCOM), along with the modern medicine he was then given on a homeopathic remedy called Ars. iodatum. The positive point here was that in spite of a high dose of a diuretic for over four months, which normally has a detrimental effect on kidneys (dehydration of kidneys causing a dip in Potassium and rise in Creatinine levels in the blood), he sustained the treatment well so that at the end of two months the Creatinine levels were well within normal limits. This case emphasizes the fact that homeopathy works wonders in animals. It can treat not only simple derangements of health but even serious conditions of the lungs and the heart. It also proves that homeopathic treatment is not a placebo effect because an animal does not know whether it is being given a medicine but still responds favorably and progresses towards health. Disclaimer: A detailed history followed by constitutional treatment by good and qualified homeopathic specialists is necessary to treat animals. The above mentioned drugs are solely to create awareness about the efficacy of homeopathy in veterinary practice and should not be given to any person or animal without the advice of a homeopath. P.S. : Pictures courtesy Dr. Nupoor Rawle, BHMS, our assistant at Homeopathic Healing in Mumbai, India. Yes Homoeopathy does help animals too,but during the course of study of efficacy of homoepathic drugs on animals I realised that the veterinarians contribution in terms of the diagnosis is equally important…and I am really thankful to my vet who gives me the opportunity , trusts in Homoeopathy and my ability to treat all animal friends successfully…. Yes!!! Homeopathy indeed, have the effect on animals as much as it effects humans. My dog used to have insomnia and night traveling all around our house which drove us insane!!! we gave Coffea 30c which worked wonderful, and our dog returned to sleep well all night long.